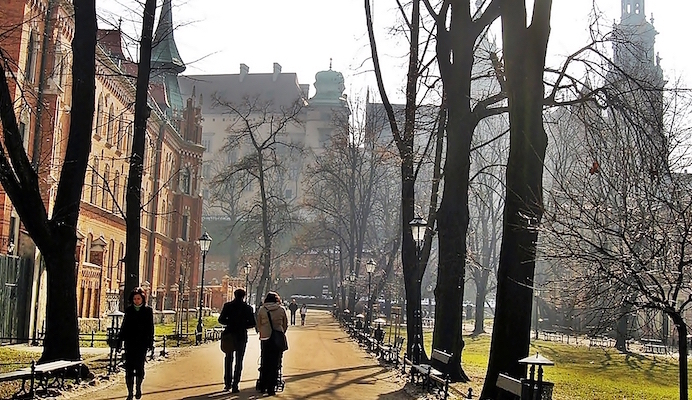 Few cities make a runseeing tour of the Old Town as simple as Kraków . The diamond-shaped greenway surrounding Krakow’s historic city center known as “The Planty” allows for a 3.4 km loop around the old city’s main sights . You can start anywhere on the long paved paths of the path that follows the track of the moat that once protected old town, but the official park entrance is off Starowislna. Head north from there and continue counter-clockwise around the park. You’ll see plenty of stunning architecture, including St. Mary’s Basilica, the Church of St. Wojciech, the large, medieval town square (Rynek Glówny), and Town Hall Tower. For a longer run, head just south down to the Vistula River paths.